Dan and I with our Bug Hats...and bugs. Dan and I planned a four-day trek along a 30km orienteering trail in Massasauga Provincial Park. 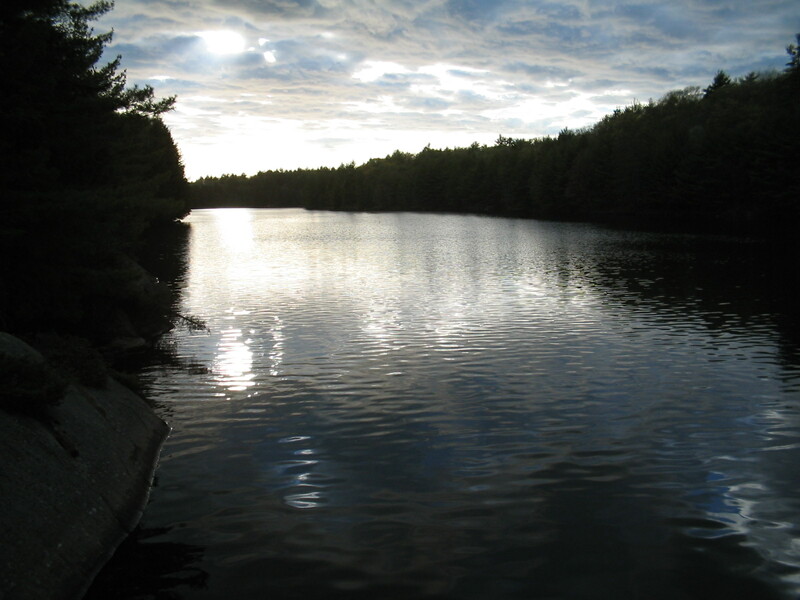 The park is accessible only by water and stretches along the Georgian Bay in Ontario. It was my first real extended backcountry trip. Who cares if I didn't know what orienteering meant? I couldn't wait to just get away, but had no idea what I was getting into. My borrowed backpack was stuffed full of things I didn't need, and it didn't matter that my trip buddy laughed when he saw how neatly folded all my clothes were. It was adventure time. We hopped in the car and spent six hours touring the middle of nowhere between London, Ontario and our destination. After predictably missing our 2pm water taxi, we opted to rent a canoe from a little paddling center called White Squall. We could handle getting to our island in the Massasauga without a captained boat, right? After wandering around in the outfitters, I almost wanted to drop my Cornell degree track for a life spent canoeing and kayaking. Colorful vessels lay stacked all around me, just waiting their turn. It really was spectacular, except for the black flies. There were hundreds, no millions of them! Everywhere! My skin prickled for days after we got home in anticipation of microscopic teeth sinking in. The shop owner smiled and informed me you just get used to them gnawing on your flesh after a while. 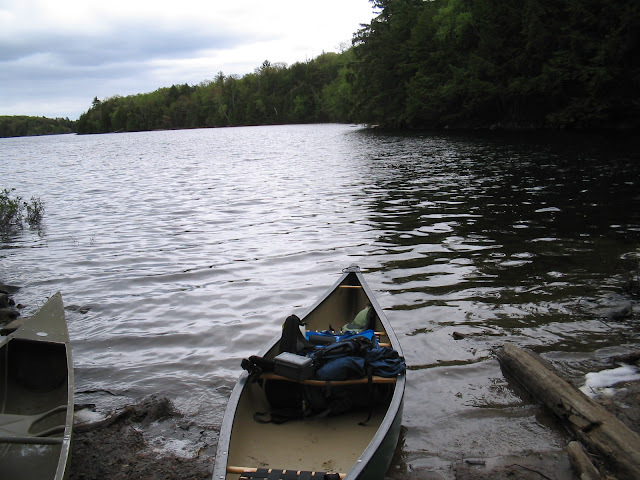 We bid farewell to the car at the top of Canoe Lake in the Massasauga around dinnertime. 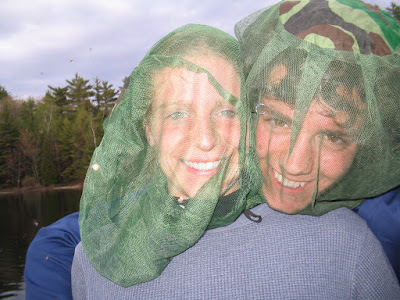 A few locals watched us swatting flies while we unpacked, and they approached us to ask us if we'd brought mosquito netting. We looked at them quizzically, and they insisted we take a pair of what Dan and I affectionately dubbed Bug Hats. They're simple cylinders of mosquito netting with elastic at one end and camouflage fabric to hold it together at the other. Who knew we'd need them? The first leg of the trip was a half hour cane from one edge of the lake to another where we picked up a portage trail. After the portage, we dropped the canoe back into the water and paddled toward an island that would be our home for the weekend; an island connecting Spider Lake with Canoe Lake. I couldn't believe we were able to discern the difference between one little island and another. After what seemed like a million extra miles of paddling, we finally found the island and an unmarked trail as the sun was setting. We hiked up the portage trail with the canoe and ran into a makeshift house with all the comforts of home, though it looked as if no one had been there for months. It was made entirely of decaying fiberboard and sat on rickety stilts. The 50's era refrigerator sitting outside became our bear-proof storage facility at night. I couldn't fathom how they could have electricity to run it in the first place. Where's the Trail? Eh, Who Cares? We initially planned on hiking the 30km North Arm Trail, but orienteering trails with no markers at all are tough to navigate. Someone had put orange tape around some of the trees as markers, but the trail didn't look like a trail at all. We decide against getting hopelessly lost and easily passed the four days exploring the park from our base camp. We swam a little one of the days and discovered my lungs don't work in water that cold. The waterways wound around like an ancient maze of scratched cliffs and small outcroppings with windswept trees clinging to them. Each little bay and inlet invited us in. We explored Spider Lake by canoe and found several very small islands, even a few large boulders popping up in the middle of the lake. During our four day stay there, we saw less than ten people, and only when we left our little island. This post is a journal excerpt from 2005. In reality, we didn't have a prayer of finding the orienteering trail. I was secretly glad when Dan agreed to take little side trips from base camp rather than getting completely lost in the woods. I came home with hundreds of black fly bites and a clear understanding of what orienteering means! Ha! My dad dropped me off in the middle of the woods when I was like 12, gave me a compass and map and told me to find my way out. Somehow I did it. sounds like a trial by fire of sorts! this was definitely by choice :) so glad you found me, and I'm glad we connected on twitter too!